As I continue to assemble the various pieces of this rather challenging documentary, James Manolides recently contacted me to compare notes on the project. James is a very important player in the LOUIE universe. Playing with the Frantics in the late 50s-early 60s, he was a member of one of the very first bands to perform LOUIE LOUIE. They never actually recorded the song, but their legacy is part of the LOUIE legend, and I’m looking forward to unleashing the full story. The last time I saw James Manolides was at the 1999 Seaside celebration that included a reunion of one of his other bands –James Henry & the Olympics, as well as Jack Ely & the Courtmen, which was the group assembled after the original Kingsmen vocalist left the band. A lot of things have happened between 1999 and 2011. Many of the people I’ve interviewed for the project are no longer alive. James asked me if it might be possible to share some of the video footage I’ve produced. Nice talking to you on the telephone. As promised, here is a brief history of James Henry And The Olympics. Accompanying the genesis of most rock and roll bands is an interesting story of circumstance. This particular one contains a set of convergences that have proved to be a blessing to me in more ways than one. As you may know, the Pypo Club was the idea and creation of a well-known Seaside “matriarch” named Oney Camberg (who incidentally was at the 1999 reunion at the age of 90 along with Pat Mason, who was also celebrating his 90th birthday (EDITOR’s NOTE: You can learn about Pat Mason by clicking HERE), as well as paying tribute to Steve Johnson, the high school football coach. They felt it would be good if the kids had a place to meet, dance and have a soda to “keep them off the streets” as it were. The venue for this little dance hall was the American Legion Hall, which occupied a portion of the second story of the Turnaround Building, that also housed the indoor heated salt water natatorium, a division of Vern’s Arcade and R & L’s Malt Shop. This took place in the summer of 1962. As fate would allow, on Labor Day weekend of that year, the Wailers were playing a dance at the skating rink, which was on Broadway (the gut) two blocks from the beach. I drove down by myself on Saturday (as I recall). When I arrived late in the afternoon, I observed a great deal of revelry around town, and also that my friends the Wailers were playing a dance at the roller rink. (I understand that this is all a bit of digression from my story, nevertheless.) The dance began far too early in the evening, and while attendance was building, there was trouble on the street. Well sir, the police made the fatal decision to call the dance off, released a couple hundred or more teens out to where the trouble was, and the tradition of labor day rioting was born. On the following afternoon, the Wailers were asked to play a free concert from the roof of the turnaround building, on the porch of the Pypo Club/ American Legion Hall, ostensibly in part as an apology for cancelling their dance the previous night, and to quiet down the kids, who had more trouble brewing for a second night in a row. Didn’t work. No sir. Anyway, like I say, this is a digression. But as the story goes on . . . My sister and the head lifeguard actually struck up a relationship (of significance to this very day). Well, the following summer (1963) I decided to spend in Seaside with my future brother in law. I had just graduated from the U. of W. and was between bands having finished up a kind of temporary engagement as bass player for The Dynamics while Peter Borg was on a sort of “leave of absence” from the band. Now it come to pass that the turnaround building had been razed over the winter, and the Pypo Club, were it to continue, would need find a new venue. I was there and volunteered to assist in it’s design and creation. There was in fact a location that was secured and we had it ready to open by mid July. I of course was placed in charge of getting bands to play, and the first was “The Counts“. Guess what. The drummer (Mike Leary) and organ player (Steve Lervold) liked the beach so much they quit the band on the spot and never looked back. Now here I am with these two guys and all we need is a guitar player to become the house band. Well, i had only booked out about three weeks ahead, so when that was done, we borrowed this guitar player and that (one of which was Larry Coryell) until we found Greg Beck, and that is how James Henry and the Olympics was born. 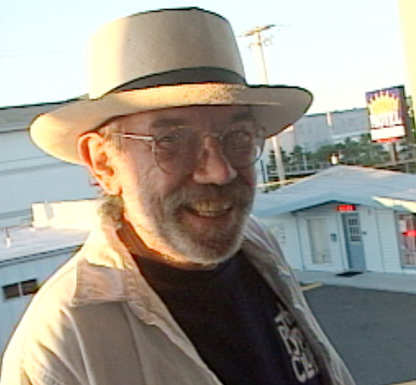 Now some thirty five years later, (1999) i get a call from one of the Beach Gremmies (that would be John Thonnes) asking me if i could reunite James Henry . . . To play for a big multi class re-union at the Seaside Elks to sort of celebrate both Oney and Pat Mason turning 90. Well, I had a band at the time with Greg Beck as the guitar player, called “The Hardly Everly Brothers” so we got ahold of the tenor player, had a practice or two, and that is the story of how we were there at the Pypo Club reunion. When I say “that band”, I mean the five that included myself on Fender bass, Greg Beck on guitar, Jim Peterson on tenor sax, Steve Lervold on Hammond organ and Mike Leary on drums. Neither of the last two were at the Seaside reunion, i moved from bass to piano, drums were played by Joel Sanders, and bass by Ray Hartman. So it was the first five of this paragraph that played on the seven or more songs recorded at Kearney Barton‘s studio and sold to Jerry Dennon (for free, probably). 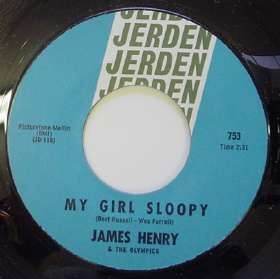 The one release on Jerden was “My Girl Sloopy” (the original title) and “Here I Stand”. “Sticky” was later released by Alex Palao on Ace Records on an album (CD) called Riot City. Not long after the 1999 reunion show, saxophone player Jim Peterson passed away. I’m very grateful to have witnessed this very special show. Wow! Just fell into this site, what great memories of life on the beach and gigging at the Pypo Club. I’m saddened to hear about “Zero” passing, he was a great guy. Love to hear about another re-union, slow song only! All the best, “Woo Woo”. Prolly played “Louie Louie” more than any tune during my era (’58/’65). Manolides had the funniest version. “J.H. & the Os” was the tightest band I every played in, “Jimmy Hank” taught me to play a drummer’s shuffle. Those were the best of best times for a “cop” band. Our last season in Seaside, the British invansion had happened, and our set list included “She Loves You”. Beach music was about around the corner, we started to grow our hair longer, drugs took hold, we all drifted apart. End of a era. I hope Greg Beck got the attention he deserved; certainly one of the hottest guitar players I ever worked with. I had a nice talk with Jim Manolides yesterday, thanks to this site for hooking us up. For the record, when we started the band in Seaside, Paul Revere & the Raiders, the Kingsmen and Don & the Good Times were regulars at the Pypo Club. None of them had ever heard the type of music we brought “south”; they got hits from Manolides’ set list. I fondly remember the Pypo Club, jammed there on the drums more than a few times. I also very much remember the riots of that time, my Grandfather was Mayor of Seaside at that time, Maurice Pysher mayor from 1961 to 1964. I miss that club.